wow those are nice! the Ursula pop is amazing! are the vinyls supposed to be mystery minis like the Aladdin ones or like the romantic couples set that will be released in February? Well, I'm not really having a positive reaction to these. I'm not sure if I've seen pictures of everything, because the funko website posted above takes like 2 days for me to load, so I had to Google. I haven't seen Ariel in her purple dress. The only one I love is Prince Eric. The Ursula pops are just bizarre considering the original Ursula is still one of the best pops, imo. I like what they did with the tentacles, but I really wish they hadn't bothered with all the facial details. :/ Especially the nose--a triangle would've looked better, tbh. I mean, I'm glad they tried to make a Ursula w/ trident pop that wasn't just a lazy variant of the original pop like the last one, but I don't care for it (I'm assuming this one's the 10 inch pop everyone's talking about?). The trident is the weirdest part. Maybe they plan to release a GITD version of that one? I'm glad we got a new version of Ariel as a mermaid without the flower in her hair (and with the bag, too! ), just wish it didn't need one of those darn stands. Chef Louie and Scuttle look about as good as they could have, I guess. EDIT: Just saw the Ariel in purple dress pop. ...Not crazy about it. So, several things regarding the Ursula Pop. I have the original one. Will it hold it´s value? Because now I´m thinking of selling it. Since I think that both versions (although the one I´m interested in is the one where she has Flotsam and Jetsam) are better. Am not usually into getting another version or replacing a Pop I already have (didn´t do it for Maleficent and didn´t do it for Cruella). However not only is this new version and improvement (even small details like the earrings that were wrong the first time) but I could use the money. I've never bought a 10 inch before, so I had no idea what the pricing would be. I can't believe they're $40! I thought at most it would be $30. 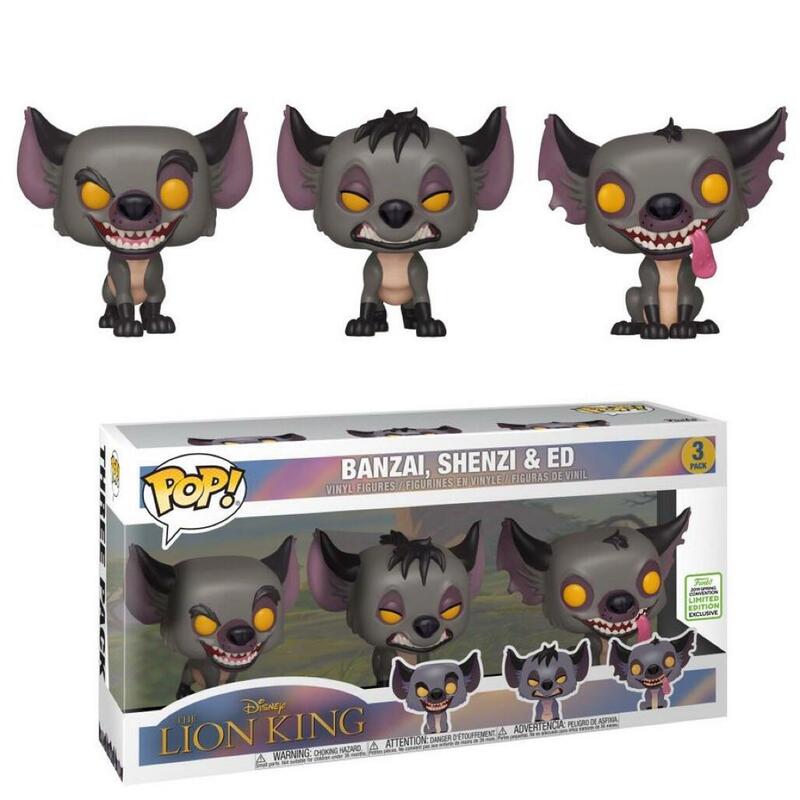 For anyone who has any experience with 10 inch pops before--do they quickly sell out? I'm just wondering if I should pre-order now or try to wait for a lower price at some point. I can probably wait on the basic Ariel pop, Scuttle and maybe Chef Louie, but I'm not sure about the 10 inch pop. I wish I hadn’t bought the original Facilier now. I always thought a variant of him with the skull mask would be great, but I thought TP&TF was too overlooked and it would never happen. Happy to be wrong. Maybe TP&TF will get a little attention with its 10th anniversary this year after all. Please please please, Bayou Wedding Naveen! Sometimes with a new release it causes the price of the original to go up. I know it happened with Mr. Incredible and Steamboat Willie. Mostly they stay at what they were and the price doesn't go down. Most 10 inch Pops have been Target exclusives and most Target exclusives sell out fast. I doubt a regular release will sell out fast. Thanks for responding, SpaceAce. The giant Ursula scene was definitely my favorite Disney moment growing up, so there's no question I'm getting it. In my head, I'm trying to think of it as a Disney Treasure with that price tag since I didn't buy the Villains, Stitch, and probably won't get the Dumbo one either. Now I'm hoping Maleficent Dragon becomes a 10 inch pop. That'll make up for the fact I didn't get the original pop. I hope Genie Jafar does, too, for Aladdin fans, but I'm not sure if I'd pay up for that one or not, unlike Maleficent and Ursula. EDIT: I wonder if the Hercules line has done really well or not. If they didn't sell well, they'd never have the incentive to make these, but I would totally buy 10 inch versions of the Titans + Cyclops + Hydra. 10 inch Ursula can be preordered in store at GameStop. They have her for $29.99. Thanks! I'm going to pre-order it there. Interesting that the release date is June 10th. I know they're always subject to change at GameStop, but usually they end up pushed back on that site than forward. I thought these would be out around the end of Feb/beginning of March. Probably for the best though since I just blew $80 on KH3. EDIT: Oh, jeez. Amazon has the release date listed as September. I'll wait on pre-ordering everything besides the 10 inch then. Don't know if I can ask here, if not sorry and delete the post, do any of you guys know where to buy fake Pops? As I mentioned before the main reason why I got into collecting Pops was to get the Disney Villains. Not only do I love them but either there's not always merchandise for all and if there are they're too expensive. With that in mind I have all the Villains available except for Captain Hook. And I can't afford the prices it's been sold as and I don't think its worth it. So I would like to fill his spot in my collection with something until Funko releases him again eventually. ^Ive seen lots of Chinese copies on Ebay(mostly Disney princesses and Harry Potter ones) but I dont know if theyd have Hook. You could also try Ali Express. Check etsy.com, too. I've seen custom-made Black Cauldron pops on there (the book version but still) so they may have villains, or maybe you could comission someone from Etsy to make them. The next Parks Exclusive is Rainbow Unicorn from Inside Out. Release date is February 16th. Off-topic: I must've missed when the pictures were first revealed, but the YuYu Hakusho pops turned out so good! It's going to be a costly year for me between all these pops, TLM anniversary and new KH merchandise, and all the albums being released this year. Thank God for coupons. I don't really collect Funko Pops, but there's some new Marvel ones coming out featuring Dark Phoenix. I'll be sure to get her. It's nice to know that in about a month's time, she'll be considered Disney as well. Just saying, but I think Esmeralda would look pretty nice as a pop. Especially since nowadays they do more dynamic poses over the old flat "square body and arms to the side" way the old pops looked. I would think that Funko would come out with THOND Pops. There are Poca + Herc Pops. Is there a way to know if any of the Disney Pops haven't sold well? If they've all sold decently, then maybe THOND, TSitS, TF&tH, TBC, TGMD, O&Co + Tarzan may have a shot!!! I don't think they are allowed to make Tarzan pops since Disney doesn't hold the rights anymore. ^ I gotcha, thank you. Now that you mention it, I do remember reading that on here! Hyenas 3-Pack for Emerald City Comic Con. The official Disney reveal for the Con hasn't happened yet (they are happening all week), but Funko posted it as a Social Media giveaway earlier this evening. The sticker indicates it will be a shared exclusive, but no retailer has been revealed as of yet. This has honestly been one of my biggest wants for years. They all look amazing. Probably gonna be expensive for me (especially if they are shared with anyone but Game Stop or Hot Topic), but I will have them. After a very disappointing New York Toy Fair (literally nothing revealed that I want) it's nice to have a reveal excite me again.